ARMY WEST POINT Club Hockey competes at a competitive collegiate level against Division II and select Division I teams in the American Collegiate Hockey Association (ACHA). If you are interested in playing club hockey at the U.S. Military Academy (USMA), please send an email using the form below. In your email, summarize your most recent level(s) of play and teams for which you have competed. Provide your position, height and weight, and pertinent statistical information (goals, assists, GAA, hits, etc. 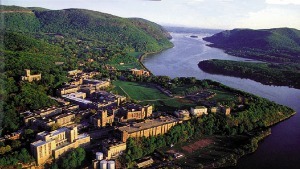 ), high school year, as well as your level of interest in West Point (applying, appointed, accepted appointment). You may also choose to provide links to video highlights. Tryouts and practice commence in August following Acceptance Day for New Cadets. 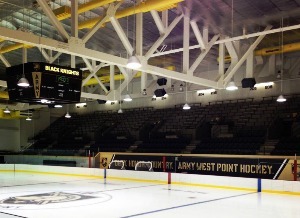 ARMY WEST POINT Club Hockey plays a 20+-game intercollegiate schedule, traveling primarily in the Northeastern U.S. as a member of ACHA's Mid-Atlantic Collegiate Hockey Association. The team practices 2-4 days per week at historic Tate Rink on the USMA campus and has an experienced civilian coach. Home games are played at Tate Rink. If you are considering pursuing an appointment to USMA or one of the nation's other service academies and serving your country as an officer, you should consider attending USMA's Summer Leaders Experience (SLE) held at USMA's West Point campus. Prospective candidates for USMA admission must meet rigorous academic, leadership, and physical requirements and obtain a Presidential or Congressional Nomination.